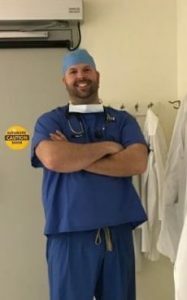 Justin Roberts ’07, former UMaine football player and business major, was initially rejected from medical school and decided to work as a pharmaceutical sales rep. That decision would prove to be a turning point in his life, and the reason he is a physician today. Roberts is currently completing his residency in anesthesiology at Rutgers University’s Robert Wood Johnson Medical School in New Brunswick, NJ. Read more about how he made the leap to medicine and his about his time at UMaine in an interview with the Bangor Daily News.